Discussion in 'The Lounge' started by buildyourown, Sep 14, 2012. I'm tempted to run 180mm cranks. I've had them before on a hardtail years ago, and thought the felt great. Love the torque you get. I'm planning on riding this bike hard. Am I asking for constant pedal strikes? I run 170mm on my DH bike w/o issue. It also makes the math with the gearing work out really well. A single 30t front ring and 180mm arms should yeild a pretty decent low gear. If the crank length is right for your legs then run it, trail bike would standard out at 175, your adding five mm to that. If you can see a noticeable difference in pedal strikes with that small of a change something else is seriously wrong. In all honesty 5mm really is not enough to give you any torque advantage either, not anything that should be a discernible difference. In short, no your not asking for pedal strikes. Agreed with Mike; it's not much of a difference. I think too much is made of crank length given the small variances in length. 5mm will probably not make a difference between having a ton of pedal strikes and being fine. That is only 2.5mm per arm. <--- NO coffee=idiot. Yeah, yeah, it is five. I run Profile 190s on the SS and have had them on the FS before. Didn't really have any issues. Unless you have super long legs 180s on a geared bike are only going to make keeping a higher cadence difficult (wonder why most road bikes come with shorter cranks than MTBs?). Those who say the extra 5mm on each arm isn't noticeable in terms of strikes is either a far superior rider than most or errs on the side of never pedaling when anything is close to their feet IMO. My 180s on my SS see a lot more strikes than 175s on my geared bikes. Frames are identical as are tires and pedals between both setups so that 5mm does make a difference (TWSS). A lower stack pedal isn't going to make much difference, especially if it's a flat since the increased surface area & spindle length is going to hinder you if you're not dead upright. 180s on a SS however are awesome for climbing IMO. Spinning not so much. That is only 2.5mm per arm. Ummmmm... Standard length for road AND Mtn is 175...... Think before adding, in the world of road cycling those who have understood teh true meaning of crank length will fit the crank length to the legs... PERIOD and no other information is used to determin the length. I'm an idiot. No posting before my morning coffee anymore. The only problem is that bottom bracket height is pretty standard. Most folks will never need the cornering clearance of a road bike, but it wouldn't work for everyone. Umm most off shelf road bikes are delivered with 172.5mm cranksets. Smaller frame sizes typically get 170mm cranks & some really small sizes receive 167.5s for kids & women's frames. Trying to fit the bell curve of people and carry over from crit racing history. Shorter cranks = pedaling out of turns. Fly to Boston and you're welcome to perform said test, I'd be happy to lighten your wallet & mess up a pair of cranks on your dime. I need one GXP set & one BB30. Maybe I'm just a hack (likely) or my experience is unique (not as likely) but I can tell you I strike 180s more than 175s. My teammate who ran 180s from an SS for a season on his geared bike bitched about it too & he's twice the rider I'll ever be. I understand fully about crank length, remember I am fit certified from trek and speccy.... I have fit A LOT of people for road bikes. Yes the kids bikes have smaller cranks and a lot of the womens frames do to, still the standard is 175. I thought crank length was about getting your knee/foot alignment fine tuned, not torque and strikes. A few SS mtb's come OEM with 180's in the larger sizes, long crank arms & SS MTB seems to be a good fit. I have a 29er SS MTB that came spec'd OEM 180 cranks, they are a good fit for my 6'3" height. On a somewhat separate note, I used to own a Specialized Stumpy HT (Splat owns it now) , and I ran some old Cook Bros 181mm cranks on it; pedal strikes were common, but I believe that was also b/c Specy BB height is a little lower than many other MTB's. If you've tried 180's in the past on MTB & liked it, seems as though a 140mm travel with 13.5 BB height might work out nicely, (even with sag calculated in as part of the mix). It sounds like you used to work at a bike shop? Virtually no road bike comes with 175's <60cm these days. He was correct about 172.5mm. I can put my hand on over a 100 different bikes right now to prove that, but your post history tells me that's probably still not enough to convince you he (/we) are right. Depending on how you sit on the bike too long cranks can also get your knees to high up when you pedal. Not sure if its the same problem on a mtb as on a road bike. I think that is pretty standard. Shoes and insoles probably have a bigger variance than those cranks. Maybe I have no idea about the difference in stack height on pedals and shoes but I would think most of that is very similar these days. On a road bike drop on the bars, bar height I think is more important. My legs would hit my chest if my drop was bigger. 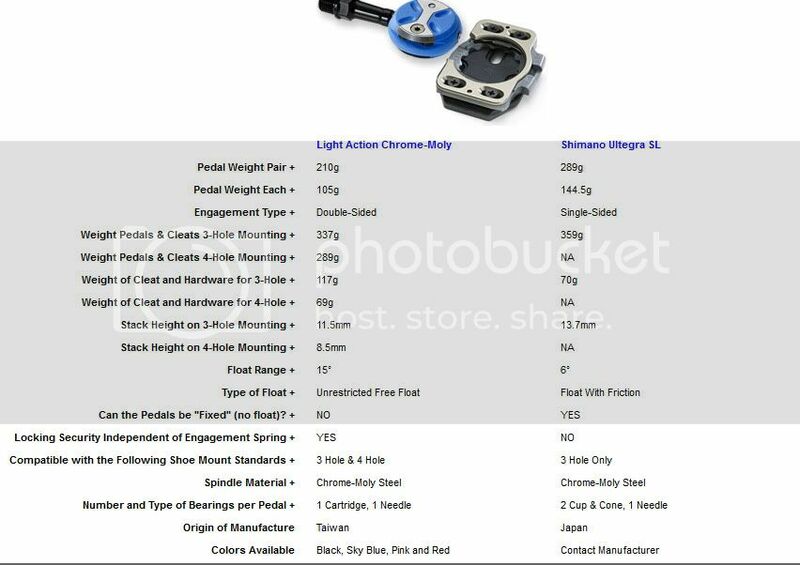 If it is accurate, that is nearly 2.5mm between pedals(alot more if you have speedplay specific shoes). I don't speak german(?) but this has a lot more info...http://www.bikefitting.com/German/Service/PedalShoe.aspx ... and has Shimano Ultegra(pd-6700) at 16.9 which would be over 5mm.